This salve temporarily relieves symptoms associated with minor skin wounds, superficial burns, swelling, and itching, and more. 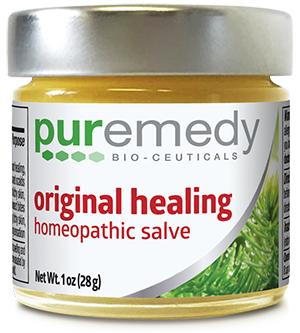 This natural Puremedy Original Healing Salve is the basis for all other healing salves made by Puremedy. It has been available for 150 years and is arguably a more effective alternative to Neosporin. It will soon be FDA-approved. We feel fortunate to have found this amazing salve at Expo West among many products that claim to be natural, yet continue to reveal chemical ingredients on their labels. Puremedy does not use chemical ingredients in their products. Original Healing Salve temporarily relieves symptoms associated with minor skin wounds, superficial burns, swelling, and itching. * It has been healing infections, skin conditions, and chronic wounds for more than a century. The FDA recognized the power of this salve in a time of crisis—as a solution to the global pandemic of Antibiotic Resistant Microbes (superbugs). Product uses are based on Homeopathic Materia Medica. *These ‘Uses’ have not been evaluated by the Food and Drug Administration. This product has not yet been clinically tested by Puremedy INC.